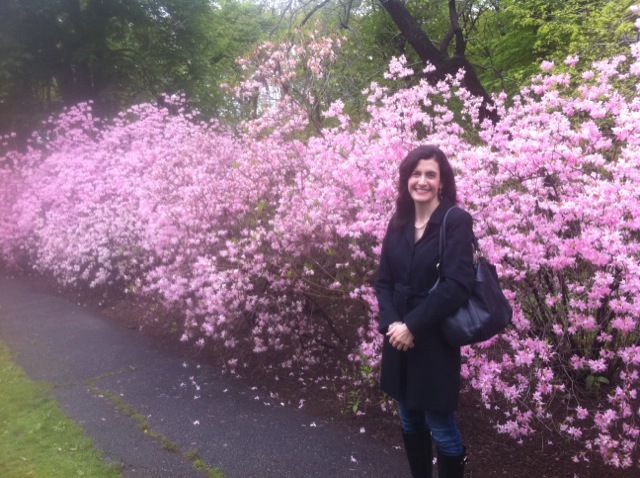 I so enjoyed my visit to Harvard’s Arnold Arboretum. Although I lived in the Boston area for a number of years, I had never been, and it is lovely. I was thrilled to have a special tour of the grounds with landscape preservationist Maggie Redfern, who filled me in on the history of the grounds. The rain stopped just in time! The azaleas were in full bloom! I also enjoyed my visit to the lovely library of the Arboretum—it was real a treat to see documents relating to E.H. Wilson’s plant expeditions in eastern Asia between 1907 and 1922. And my tour of the new Weld Research Center of the Arboretum was terrific—my interest was especially captured by their new, state-of-the-art 3-D microscope! My talk on Wednesday night was well-attended and the Q & A was lively. Thanks to Ned Friedman, director of the Arboretum, and Pam Thompson, Manager of Adult Education, for the invitation and the hospitality! Thursday I was thrilled to meet Sara Schechner, the Curator of the Collection of Historical Scientific Instruments at Harvard. We had a great talk about early microscopes and telescopes. I’ll be going back to Harvard soon for some work with microscopes old and new with Sara and Ned. The Philosophical Breakfast Club at TED Global This June!!! The Philosophical Breakfast Club at TED Global This June!!! Happy Birthday, William Whewell (1794-1866)! !